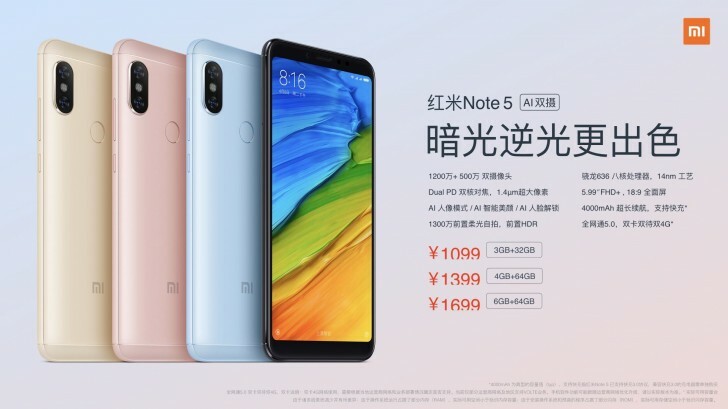 Xiaomi has launched an updated version of the Redmi Note 5 Pro in China. Called just Redmi Note 5, this new variant features is basically the Indian Redmi Note 5 Pro with some crucial improvements. First, the similarities. Both models have the same 5.99-inch, 2160x1080 pixel IPS LCD panel, Snapdragon 636 chipset, 3/4/6GB of RAM with a 32/64GB of storage and a 4000mAh battery. But the 12MP rear camera now has an F/1.9 lens compared to F/2.2 on the Indian model, larger 1.4μm pixels compared to 1.25μm, and also has dual pixel PDAF for faster focusing. The 5MP secondary camera on the back is identical though. On the front, the 20MP camera from the Indian model has been replaced with a 13MP sensor. The cameras are also AI driven, with things such as portrait mode, beauty mode and face unlock being improved with AI, although that's likely the same as on the Indian model even if it's not marketed as such. Lastly, the Chinese model comes with Android 8.0 Oreo out of the box running underneath MIUI 9 and also support for Project Treble while the Indian model ships with Android 7.1.1 Nougat. The new Redmi Note 5 will be available in Black, Blue, Gold and Rose Gold and prices start at RMB 1099 ($173). Is redmi note5 will get oreo update or not?